Renewing our auto insurance every six months is something we all do but do you ever really look to see what you are paying for? And do you really know what it covers? Many people are shocked to learn that Florida does not require car owners to maintain Bodily Injury (BI) coverage. This is the coverage that pays for injuries caused by the at-fault driver’s insurance in a car accident. Too often I have clients who were injured in an accident expecting that the at-fault driver is required by the State of Florida to carry insurance that will pay for their injuries – unfortunately, when the other driver has the minimum required coverage I’m left having to explain this sad fact to my client. 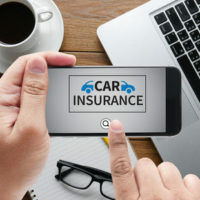 There is, however, a way to protect yourself from drivers that have the minimum required coverage and also from the thousands of drivers in Florida who are uninsured. This is why it’s imperative to check your car insurance coverages each time you renew to make sure you are protected. Property Damage Liability (PDL) Coverage – pays for damage to other people’s property (typically other cars) caused by your vehicle. This does not pay to fix your car. Collision Coverage – pays to repair your car for damage caused when you are in an accident whether or not you were at fault in the accident. This is good to have if you are hit by an uninsured driver or if you cause an accident. Personal Injury Protection (PIP) Coverage – pays for 80% of your medical bills and 60% of your lost wages up to a maximum of $10,000 if your are in an accident, no matter who is at fault. Bodily Injury (BI) Coverage – pays claims made against you by others who were injured in an accident where you were at fault for all or a portion of the accident. This coverage protects you from having to pay out of your own pocket if you injure someone in an accident. The more you have to lose the higher BI coverage you will want to have to protect your assets. Uninsured Motorist (UM) Coverage – This coverage provides you with additional insurance for injuries caused by another driver who either does not have Bodily Injury (BI) coverage or who was uninsured at the time of the accident. (1) If you are looking to protect yourself from having to pay if your cause damage to property or to another person then look to add to your Property Damage Liability (PDL) and/or your Bodily Injury (BI) coverages. (2) If you are looking to protect yourself from not being able to pay for damage to your car or injuries to your body then look to add Collision and/or Uninsured Motorist (UM) coverages. Because Florida does not require owners to have Bodily Injury coverage you should consider adding uninsured motorist (UM) coverage to protect yourself and your family. Most insurance companies allow you to purchase UM coverage up to an amount that matches the amount of the Bodily Injury (BI) coverage on your policy. The point of insurance is to protect you and your family, so next time your policy renews take a look at your coverages and make sure the people and things that matter most to you are protected.